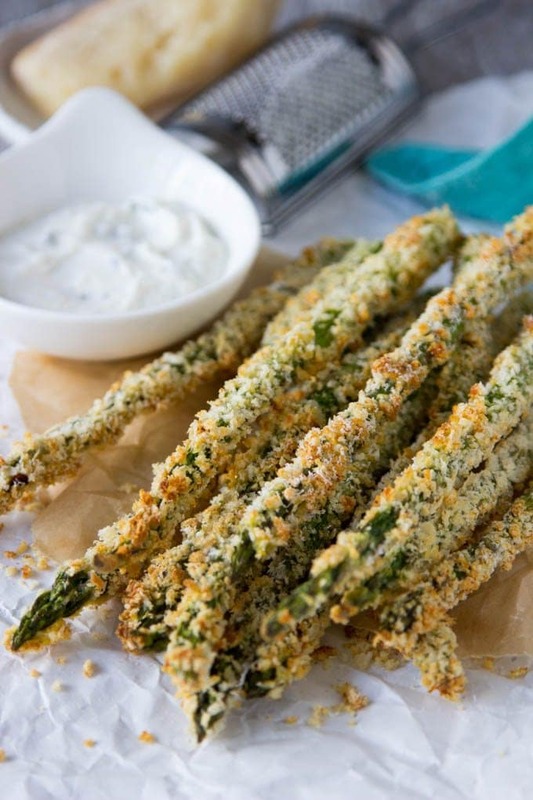 Baked Asparagus Fries + Creamy Parmesan Dipping Sauce- a healthy alternative to traditional French fries. 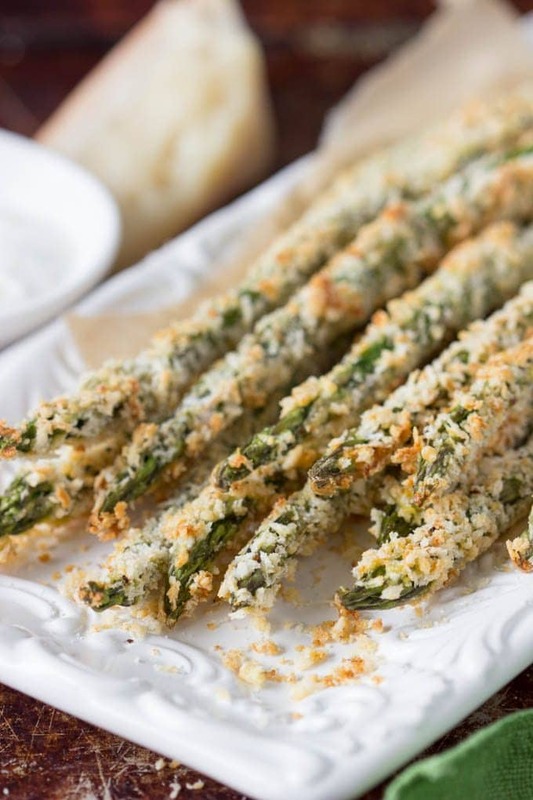 Crunchy Panko crusted spears of asparagus with a hint of spice (thanks to red pepper flakes and chili powder-optional) served with a creamy Parmesan dipping sauce. Perfect as an appetizer, snack or side dish. Not only are these tiny green spears delicious and versatile they are REALLY good for you! 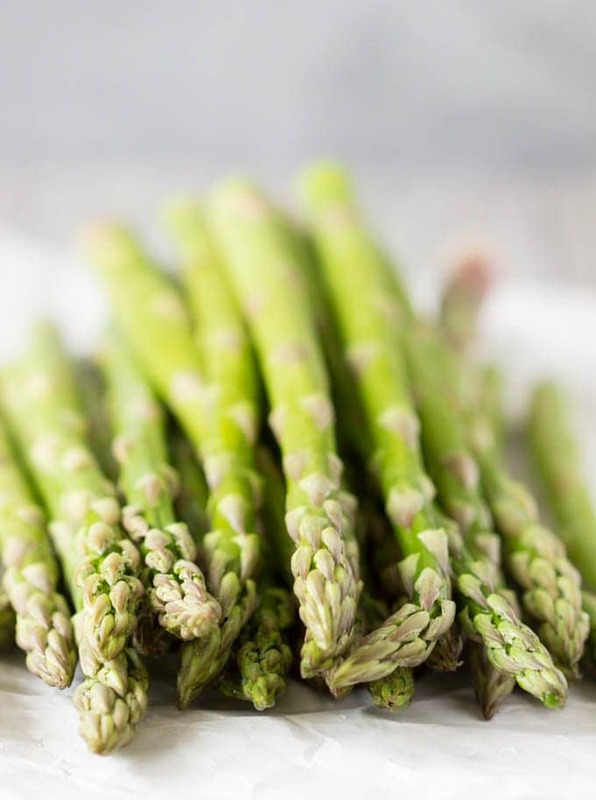 Asparagus is packed with antioxidants helping to neutralize cell damaging free-radicals which may help to protect the skin against damaging sun rays ,may help slow the aging process and may help protect against certain types of cancer (like breast, bone and lung). High in fiber and rich in nutrients such as Vitamins A, C, E and K, folate and chromium, which have been shown to help with such things as fighting cognitive decline, regulating blood sugar levels and boosting immunity. Asparagus also contains a number of anti-inflammatory compounds which may help protect against type 2 diabetes and heart disease. All of that goodness packed into these little spears! 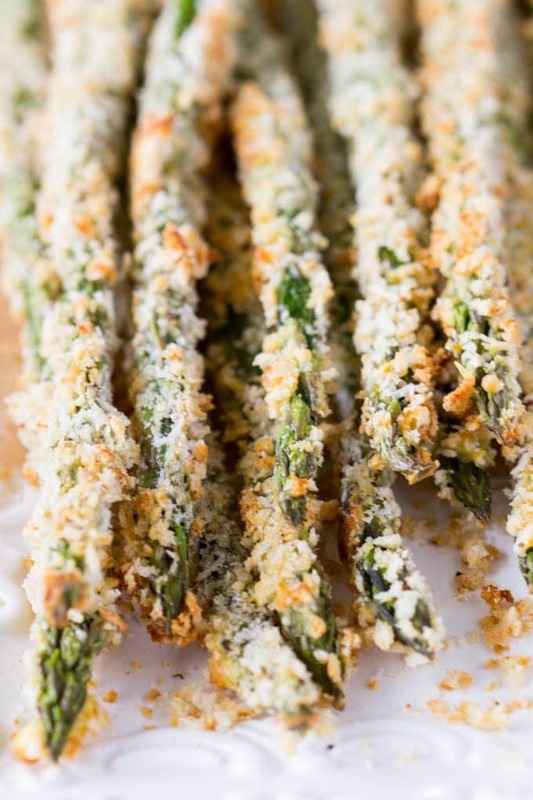 So now that you know just how good asparagus is for you…it’s time to get to making these Baked Asparagus Fries! They are REALLY easy! 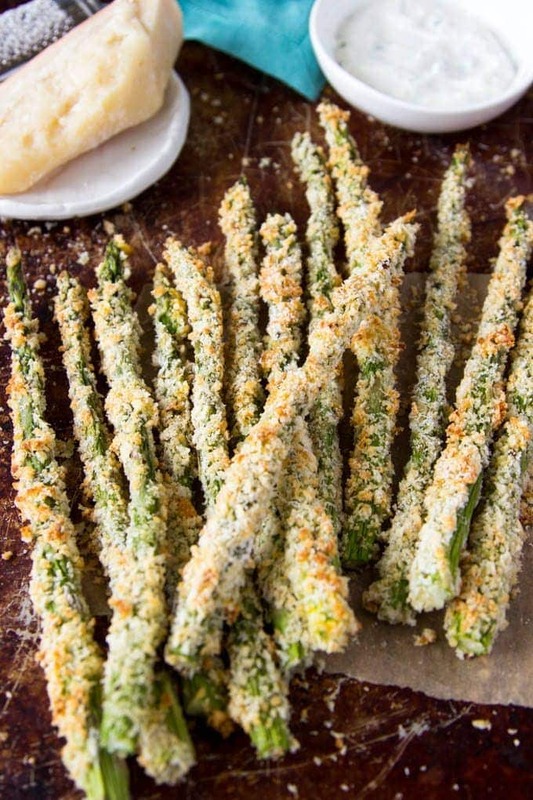 similar to other panko crusted foods ( like Panko Crusted Chicken with Honey Mustard Dipping Sauce) you’ll dredge the asparagus in flour, followed by a dip in an egg bath and finish by rolling the asparagus spear in the panko mixture and pressing firmly so the panko adheres to the asparagus. Pop them in the oven for about 10 mins. and that’s it! You have a tasty , healthy snack, appetizer or side dish. These would also be great served alongside your favorite brunch items …like a tasty omelette, or Scrambled Eggs with Goat Cheese and Chives, or how about an Easy Breakfast Casserole with Ham & Cheese. Love Asparagus? Here are 21 more recipe ideas to enjoy fresh asparagus. 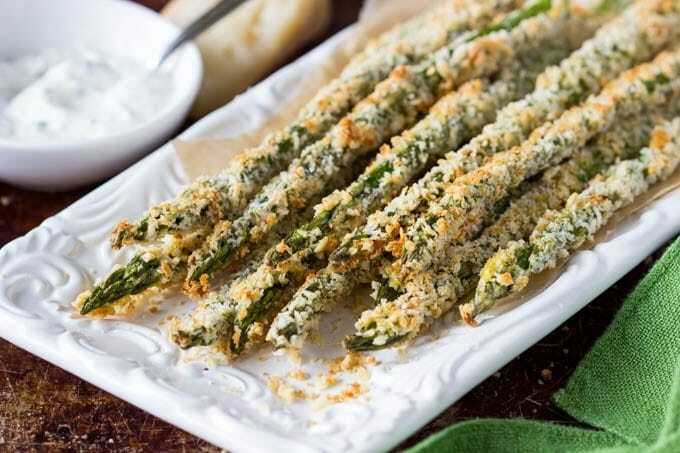 Crunchy Panko crusted spears of asparagus with a hint of spice (thanks to red pepper flakes and chili powder-optional) served with a creamy Parmesan dipping sauce. Perfect as an appetizer, snack or side dish. Preheat oven to 425 F. Spray a baking sheet with non-stick spray, set aside. Line up three shallow bowls( long enough to fit asparagus). Place flour in first bowl. Place beaten eggs in second bowl. Combine Panko, Parmesan, red pepper flakes, chili powder and salt and pepper in the third bowl. While asparagus in cooking, prepare dipping sauce by combining sour cream, Parmesan cheese and chives in a small bowl. Asparagus best served immediately after removing from oven. These are delicious – so fresh, crispy and crunchy. Wonderful way to enjoy fresh asparagus! Thanks MB! Glad you enjoyed them! You can make asparagus into fries? HOW COOL IS THAT! These fries look incredible! Thanks for sharing!